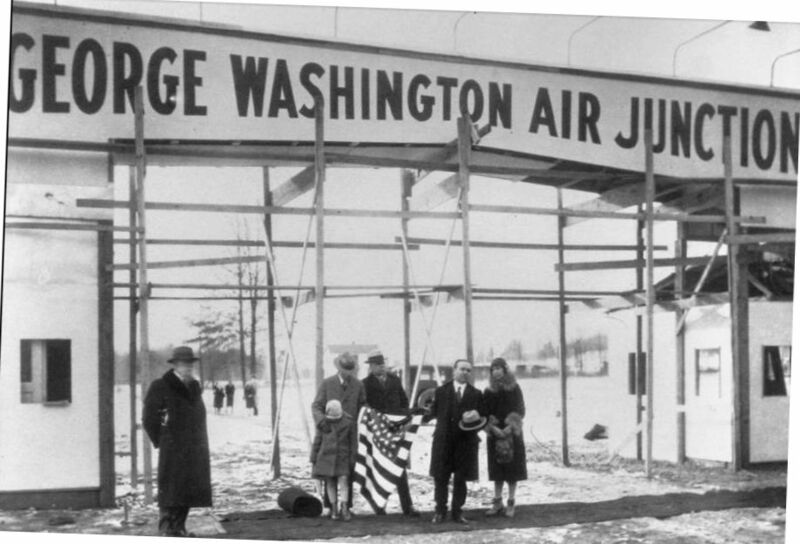 A 1925 photo of the entrance to the “George Washington Air Junction”. which he planned as Washington’s transatlantic commercial airport. with a 7,200' runway & mooring fields for transatlantic Zeppelin flights. Woodhouse was convinced that Zeppelins were the future of aviation. was a 1925 photo showing the entrance sign, evidently still under construction. 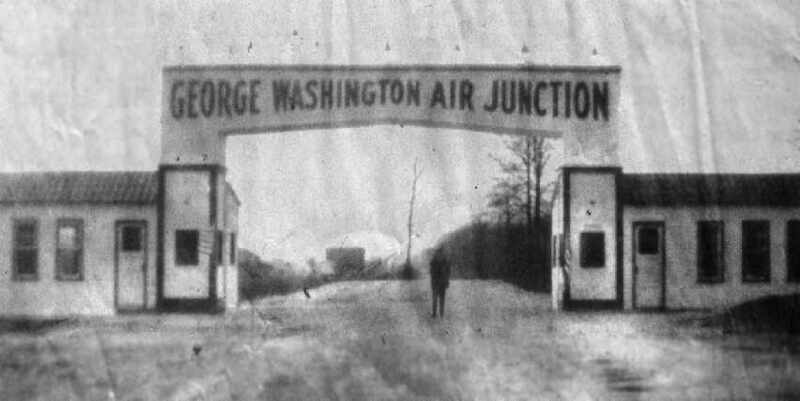 An undated photo of the entrance to the “George Washington Air Junction” (from the Fairfax County Library, courtesy of Charlie Davis). The entrance was presumably located along what is now Lockheed Boulevard, near the entrance to today's Huntley Meadows Park. just south of what would eventually become Lockheed Boulevard. (from the 3/3/38 issue of the Herald Times, from the Fairfax County Library, courtesy of Charlie Davis). along with a hangar & an administration building. The article said, “Hybla Valley, largest available airport site near the Capital. 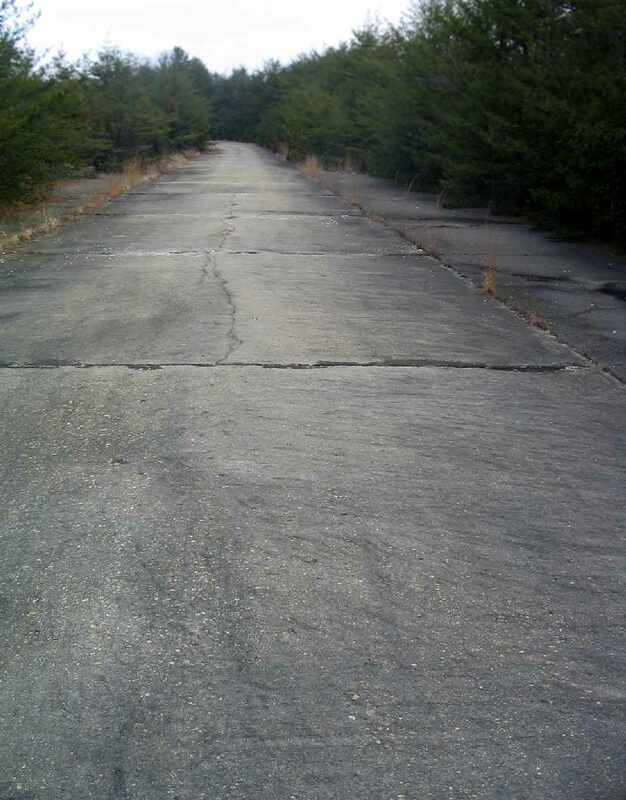 Hybla Valley, flat as a table & 3,800 acres in extent, lies 3 miles south of Alexandria, flanked by U.S. Highway #1.
and there is no indication that any aircraft ever operated from the site. It was never depicted on any government-published aeronautical chart that has been located. 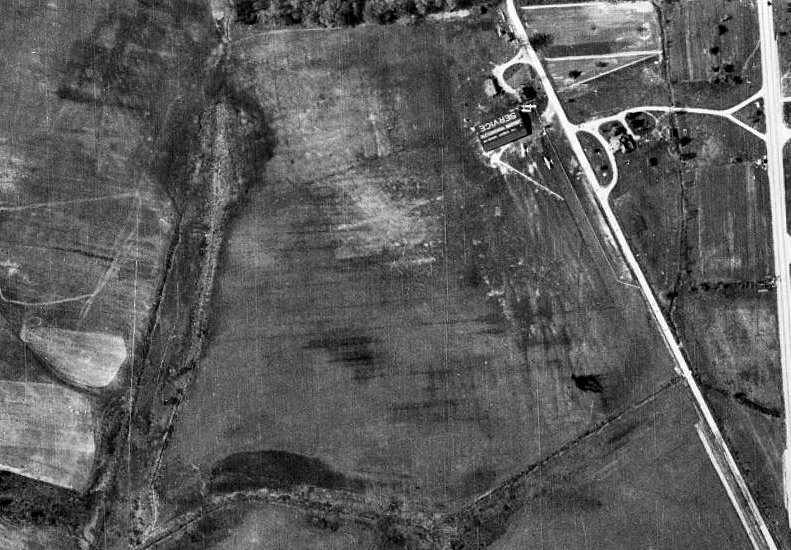 A 1937 aerial view (from the Fairfax County Historical Imagery Viewer) depicted the faint trace of the 3 former runways at the site of the George Washington Air Junction. Woodhouse eventually lost the land through a combination of defaults, foreclosures, and lawsuits. when the federal government purchased it for $60,000. 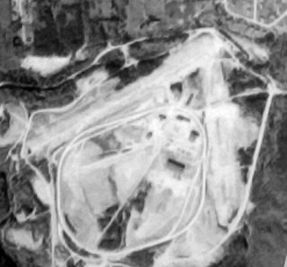 A 1949 aerial photo no longer showed any trace of the 3 runways which had been depicted in the 1929 aerial photo. as one of 4 batteries which provided air defense coverage for the nation's capital. The battery was manned by 4 officers & 30 enlisted men. for which they constructed 2 large circular antenna fields. When the NRL project wrapped up in 1971, the property was declared surplus by the federal government. sold 1,261 acres of surplus land (including the former Air Junction site) to Fairfax County for $1. and it became the Huntley Meadows Park. and not a trace is visible of the 3 runways which were depicted in the 1929 aerial photo. The site of the George Washington Air Junction is located southwest of the intersection of Lockheed Boulevard & Harrison Lane. A 1934 aerial view looking north at Beacon Field (courtesy of Don Thompson). as part of the Department of Commerce's network of commercial airways which ran along routes between major cities. Aubrey Burdette rented some open land at the site from the Reid family to begin giving flying lessons & rides. Burdette Flying Service quickly became quite busy, and also employed Sanford Gulick as an instructor. 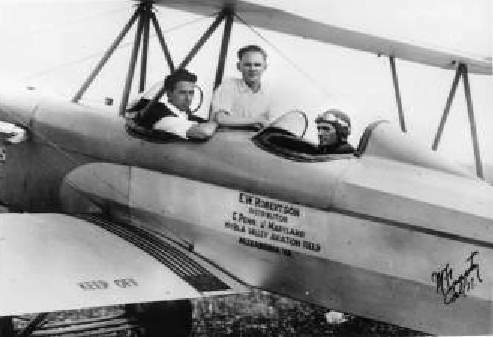 Bob Ashburn eventually joined the staff, and in time the Ashburn Flying Service took over from Burdette Flying Service. It wasn't until 4/11/32 that a license was granted for Beacon Hill Airport (according to the book "Virginia Airports"). 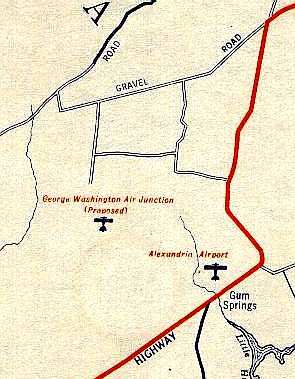 No airfield at the location was yet depicted on the May 1932 J-18 Washington D. C. Airway Map (courtesy of Chris Kennedy). was in the 1934 Department of Commerce Airfield Directory (according to Chris Kennedy). 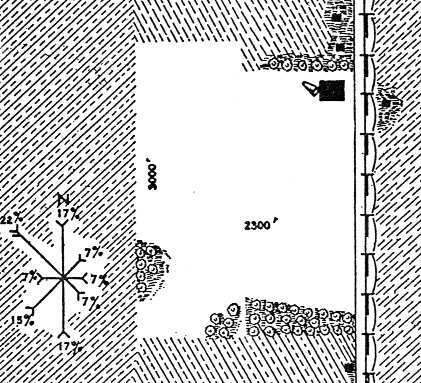 It described the field as consisting of an irregularly-shaped sod landing area, measuring 1,200' north/south x 1,500' east/west. 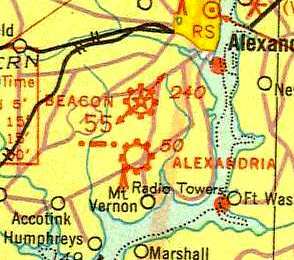 Beacon Field & Alexandria Airport, as depicted on the 1935 Washington Sectional Chart. consisting of an irregularly-shaped sod field, measuring 1,500' east/west by 1,200' north/south. It was said to be operated by the Department of Commerce, and to offer facilities for servicing aircraft, day & night. described Beacon Field as consisting of an irregular sod landing area, measuring 1,500' x 1,200'. 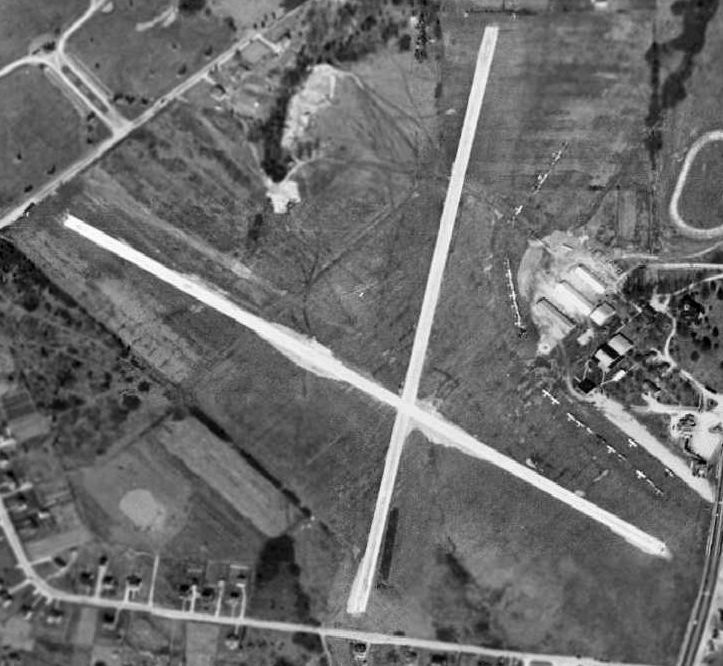 The aerial photo in the directory depicted a hangar at the north edge of the field. 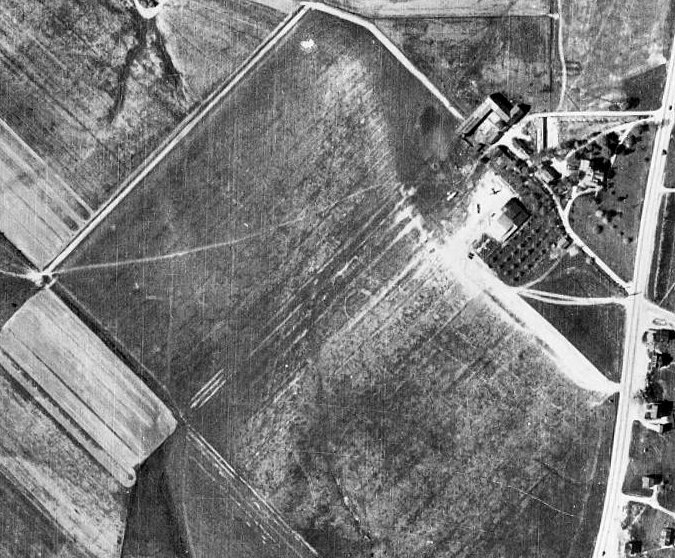 with a rectangular grass airfield with a hangar & several light aircraft on the east side of the field. A circa 1939 photo of Charles Duggar in front of a 1938 Aeronca NC27783 Model K (2 cylinder) chocked & running at Beacon Field. A hot summer day – the windows fully extended in the upstairs airport office in the building on the left. and later named his estate Beacon Hill in honor of the airport. 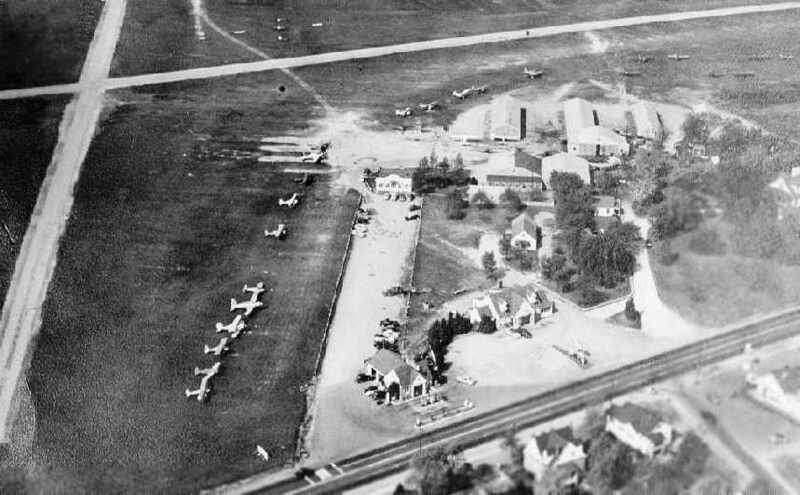 Godfrey also later bought the George Farm airfield in Leesburg, which later became Godfrey Field. Prior to World War II, Beacon Field hosted the Civil Aeronautics Administration Region 1 Aviation Safety District Office. In 1940, a group of African-American pilots incorporated the Cloud Club in Washington, DC. They began flying at Beacon Field in their own airplane, a 1939 Piper Cub Coupe. Things did not go smoothly for the Cloud Club in Alexandria, though. Very soon they were accused of violating airfield rules, and were soon kicked out of Beacon Field. They moved to Croom Field in MD. and later for training women ferry pilots as part of the WASP program. A circa 1940s aerial view looking west at Beacon Field (courtesy of Charlie Davis). In 1942 the US Navy took over Beacon Field as a primary training base for Naval Aviation Cadets. but hardly anyone noticed the damage due to the excitement. The April 1944 US Army/Navy Directory of Airfields (courtesy of Ken Mercer) described Beacon Field as having a 2,000' runway. (with the longest being a 3,000' northwest/southeast strip), and said that the field also had 2 hangars. 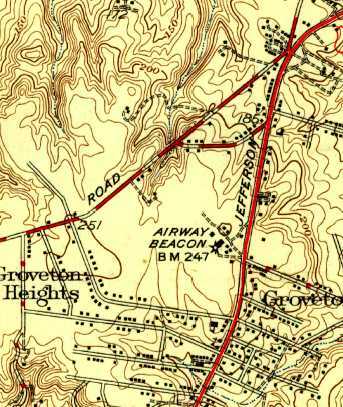 The 1945 USGS topo map depicted an Airway Beacon & several buildings at the site of Beacon Field, but did not label the airport. According to the book "Virginia Airports", "Following the war Harry Lehman took over the airport business with his family. For a time business boomed. Sixty planes were hangared there & many others were tied down outside." 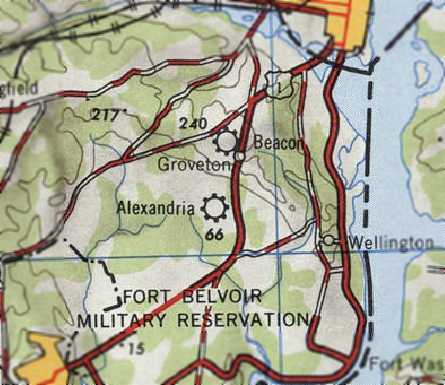 The 1946 USGS topo map depicted Beacon Field, as well as the nearby Alexandria Airport. with 5 hangars & numerous other buildings on the east side of the field. A total of 28 light aircraft were visible parked on the east side of the field. 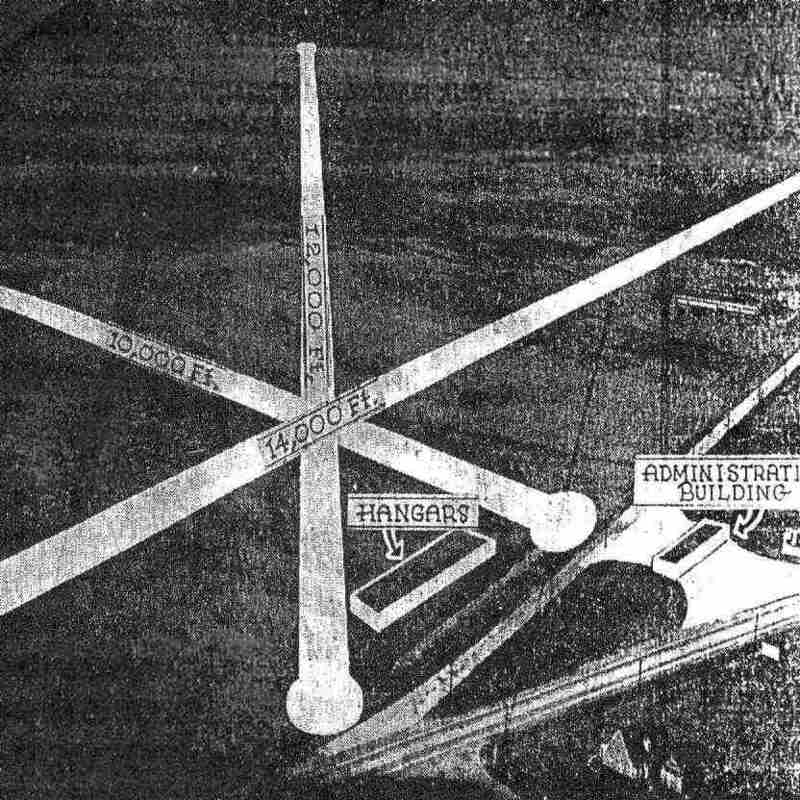 The 1949 USAF Target Complex Chart depicted Beacon Field as having two 2,000' runways. 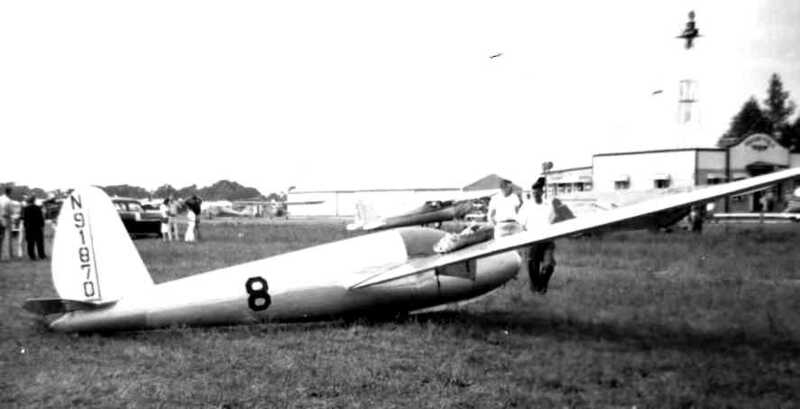 A 1949 photo by Art Brown (courtesy of Robert Brown) of a Schweizer 1-23 at a 1949 glider meet at Beacon Field. A Beacon Field hangar & light beacon tower are in the background at right. at a 1949 glider meet at Beacon Field. 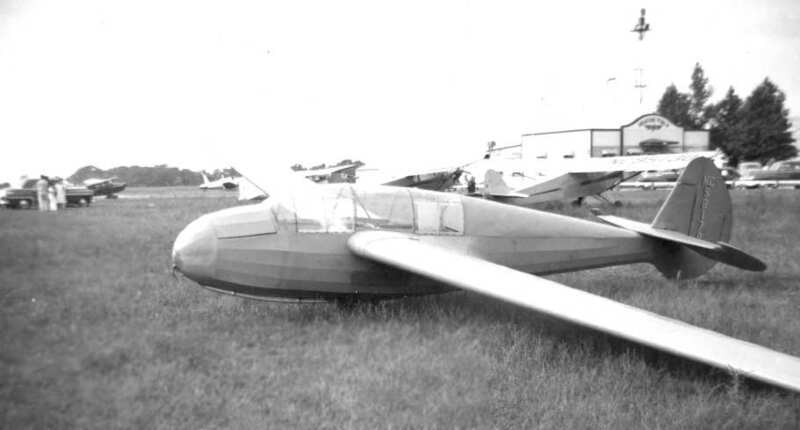 The Washington Soaring Club held the first Mid-Atlantic Soaring Contest at Beacon Field in 1949. Due to its close proximity of Washington, the meet received unequaled newspaper coverage. such as slow rolls on tow & outside loops in his Schweizer 1-23 sailplane. The second Mid-Atlantic was held again at Beacon Field in 1950. The club moved to Martinsburg, WV the next year. A circa 1940s-50s advertisement on a high school athletic field promoting Beacon Field (courtesy of Don Thompson). as having 2 runways, with the longest being a 2,313' hard-surface strip. 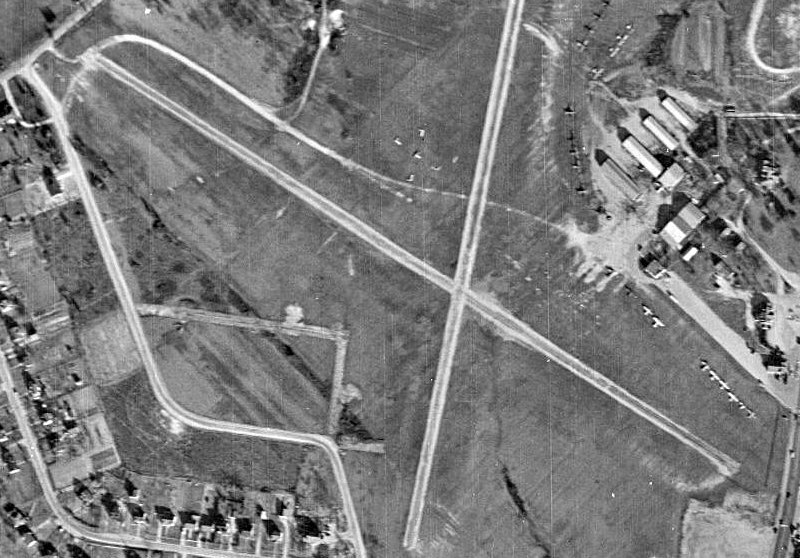 The 1951 USGS topo map depicted Beacon Field as having 2 paved runways & a cluster of buildings on the east side. with quite a few hangars & dozens of light aircraft on the east side of the field. 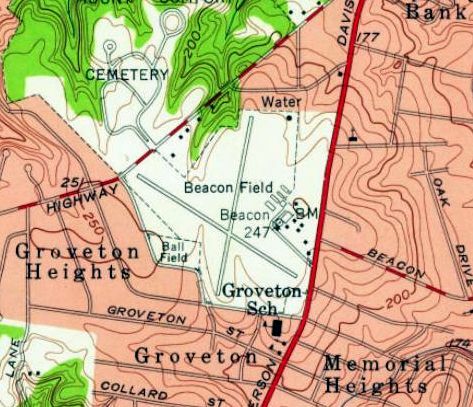 The 1956 USGS topo map still depicted Beacon Field as having its namesake beacon tower on its east side. Beacon Field's namesake beacon tower was was repossessed by the Federal Government in 1957. An undated photo of the Canadian Car & Foundry Loadmaster 1 which spent 2 years at Beacon Field. which resided at the field late in the airport's history. in an attempt to maximize lift & reduce drag. when the US Army was exploring potential for a new troop carrier. During the demonstration, the Loadmaster made a forced landing, and was removed to Beacon Field. a bent propeller & skin tearing from the belly-landing. 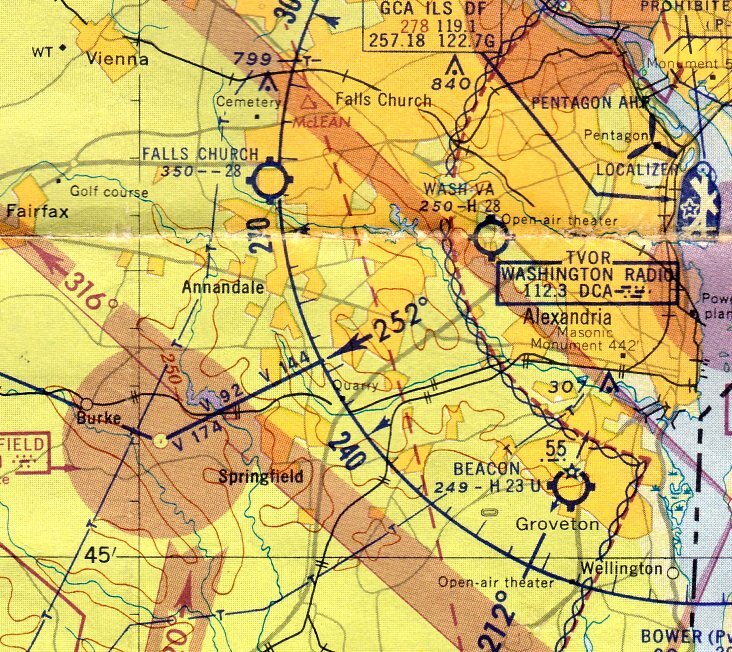 The last aeronautical chart depiction which has been located of Beacon Field was on the July 1958 Washington Local Aeronautical Chart. It depicted Beacon Field as having a 2,300' paved runway. An undated photo of the Canadian Car & Foundry Loadmaster 1 at Beacon Field. the Loadmaster, after an unusually short takeoff run, took off from Beacon Field. 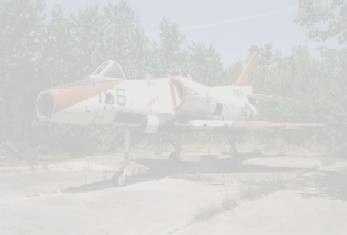 where it was parked in the mid to late 1960s never to fly again. Craig Lynch recalled of Beacon Field, “I grew up behind the airport & saw it torn down as a young boy. The Reid family owned the land the airport was on & the Reid mansion was on the airport property. and looking out the window... not an unusual thing... and saw this 'thing' being towed up the highway. When I got to the airport that afternoon, there was the Burnelli sitting there after it's minor crash at Ft. Belvior. It sat there for a couple of years whilst Paul Zimmer's shop did repairs on it. The cockpit of the Burnelli was laid out as an almost carbon copy of the DC-3. but it was some time after that when Paul Zimmer & Marvin Heintzel actually flew the thing over to Friendship in Baltimore. Before Beacon Field closed, one of the masonry buildings that had housed a Link Flight Simulator was moved to adjacent family land. According to the book "Virginia Airports", "On 9/30/59 the Beacon Field hangar doors closed for the last time & another historic airport disappeared." The Reid & Lehman families closed the airport on 10/1/59. The City View antebellum mansion on the airport grounds was torn down in a day in the fall of 1959. 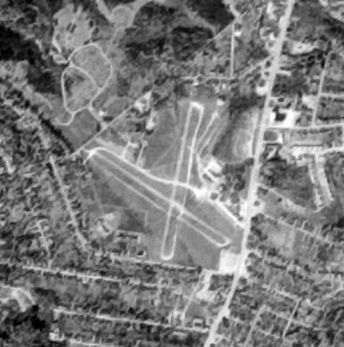 When Beacon Field closed, many of its resident aircraft moved to nearby Washington-Virginia Airport. Harry & Mary Lehman moved his flying business across the Potomac River to Hyde Field, MD.. 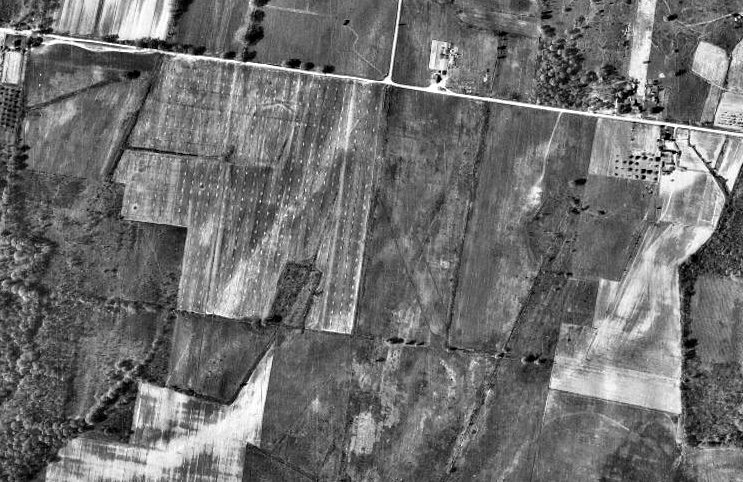 The last photo which has been located showing Beacon Field still intact was an 11/9/59 USGS aerial view, taken only a month after its closure. 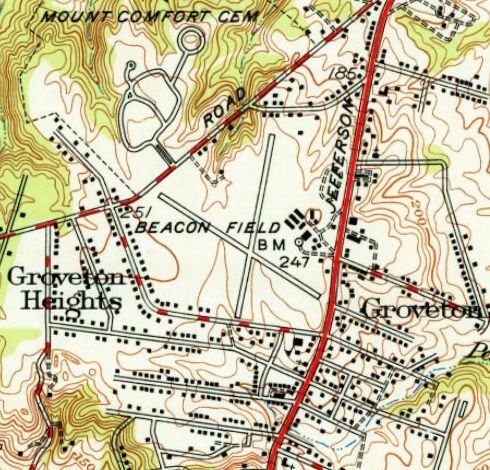 Beacon Field was no longer depicted on the 1961 USGS topo map. with one building of the new shopping center having been erected. All of the north/south runway still remained intact, along with the western half of the northwest/southeast runway. Tom Cloud recalled, “Beacon Field... About 1963 or 64 I biked over to watch some drag races on the old runway. I watched a bat-winged 1959 Chevy just about lose control but the driver gathered it in. 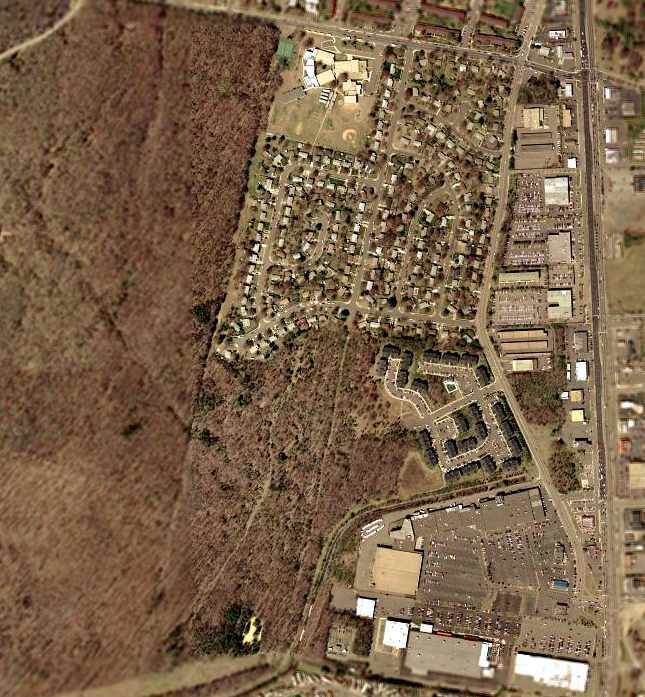 The 2002 USGS aerial photo of the site of Beacon Field showed that the property was occupied by the Beacon Hill Mall. No trace remains of the former airfield. As of 2008, the masonry building which had previously housed a Link Flight Simulator reportedly still stood on adjacent family land. 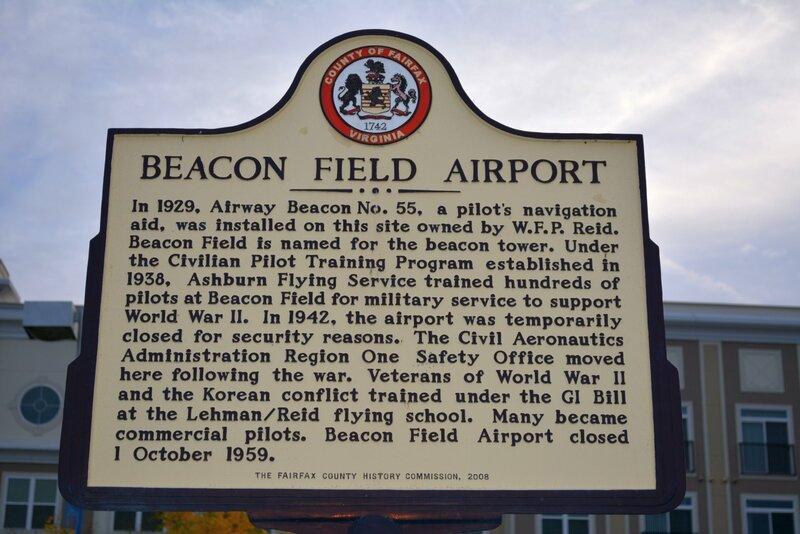 In 2008 the Fairfax County History Commission placed an interpretive highway marker titled “Beacon Field Airport” at Memorial Street near Jefferson Davis Highway / Route 1. A 2013 photo of the Fairfax County History Commission interpretive highway marker titled 'Beacon Field Airport'. Beacon Field's address was 2013 Richmond Highway. The site of Beacon Field is located at the intersection of Beacon Hill Road & Richmond Highway (Route 1). 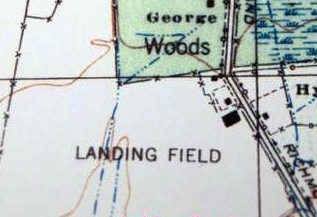 Alexandria Airport was labeled as “Landing Field” on the 1926 USGS topo map. from a field further north along the Potomac. 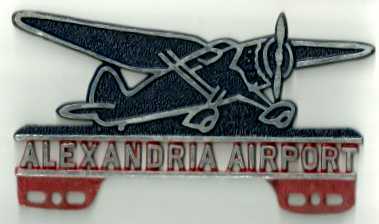 and established what was originally known as Alexandria Airport in 1925-26.
with the eastern boundary formed by the original alignment of Washington & Richmond Highway (Route 1). An undated photo of Elvin Robertson in the rear cockpit of one of Hybla Valley's Eaglerock biplanes. and later became a dealer for Alexander Eaglerocks with Curtiss OX-5 engines. and became popular in 1928 after Lindbergh’s New York to Paris flight. The airfield area at Alexandria Airport, as depicted on a 1929 Commerce Department Airway Bulletin (courtesy of Michael McMurtrey). The bulletin described Alexandria Airport as consisting of a 110 acre sod field, measuring 3,000' x 2,300. One 140' x 60' hangar was situated at the northeast corner of the field. The owner & operator was listed as Mount Vernon Airways. An advertisement for Alexandria Airport's Mt. Vernon School of Aeronautics from the 11/3/30 Washington Daily News (courtesy of Mickey Marche). 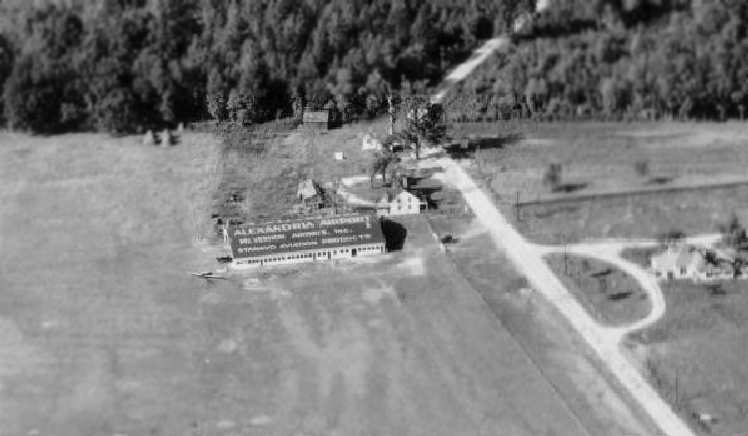 A circa 1930s aerial view looking east at the hangar at Hylba Valley, with one biplane on the field. as depicted on a 1930 Standard Oil Company road map (courtesy of Mike Keefe). Alexandria Airport, as depicted on the May 1932 J-18 Washington D. C. Airway Map (courtesy of Chris Kennedy). 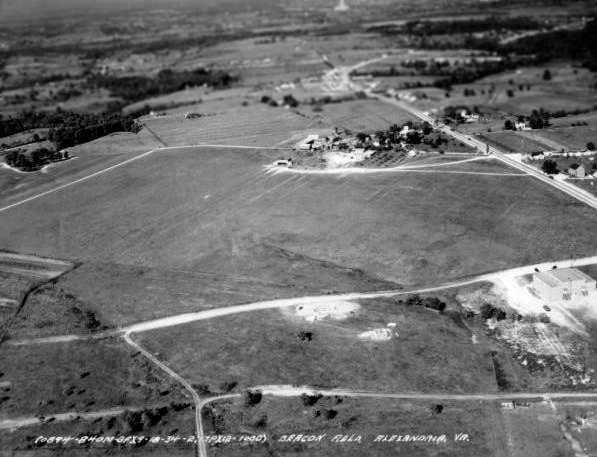 A 1934 aerial view of Alexandria Airport (courtesy of Don Thompson). A 1934 aerial view of the Alexandria Airport hangar (courtesy of Don Thompson). consisting of a rectangular 2,600' x 1,200' sod field, having a single 3,000' northwest/southeast runway. A hangar was said to be marked with “Mt. Vernon Airways”. The field was said to offer facilities for servicing aircraft, day & night. A 2012 photo by Cindy Furman of what appears to be a automobile license plate frame advertising Alexandria Airport, of unknown vintage (circa 1930s?). Cindy reported it was “found... on our recently purchased farm in Warrenton Virginia. It is a metal sign about 10 inches x 6 inches. The airplane is a dark blue & the lettering is silver with a red background & there are holes in the bottom, maybe for hanging? described Alexandria Airport as consisting of single 4,000' northwest/southeast sod landing strip. at the northeast edge of the field. with a irregularly-shaped grass airfield with a hangar & several light aircraft on the east side of the field. although this was not consistent, as some later maps continued to label it as Alexandria Airport. E.C. Germain operated Washington Air Charter Service from Hybla Valley prior to WW2. This firm was a division of Mount Vernon Airways, Inc. The employees of the Engineering Research Corporation (builders of the Ercoupe) operated a glider club at Hybla Valley Airport. 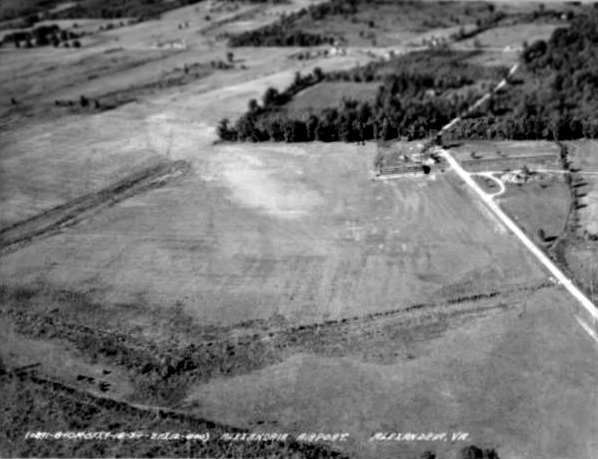 A circa 1939 aerial view looking north at Hybla Valley Airport. In 1939, with war on the horizon, Robertson sold the field to the Navy to train military pilots. (the others being Hyde, Beltsville, Cheltenham, Nottingham, and Riverside). A 1940 aerial view depicted Hybla Valley as having 4 runways. 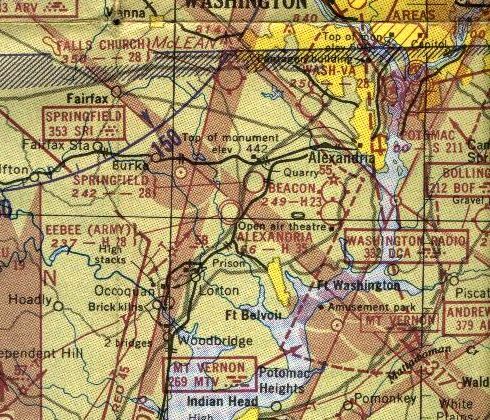 Hybla Valley Airport was labeled simply as "U.S. Navy" on the 1940 & 1942 Washington Sectional Charts (courtesy of Mike Keefe). An 8/14/43 U.S. Navy aerial view looking southeast at “Hybla Valley Landing Field” (courtesy of Brian Rehwinkel). It depicted the field as having 4 unpaved runways, with several hangars on the east side of the field. and described as having a 5,000' runway. and Hybla Valley Airport was reopened as a civil airport. It was depicted as a commercial airport on the 1945 Washington Sectional Chart (courtesy of John Voss). with the longest being 3,700'. 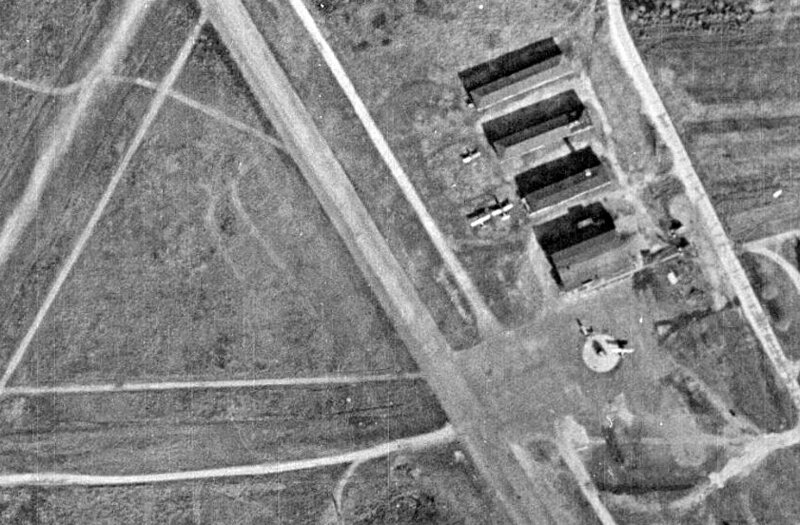 Four hangars or buildings were situated east of the runways, next to the road. (with the longest being a 5,280' northeast/southwest strip), and said that the field also had 4 hangars. It listed the operator as Mount Vernon Airways, and listed the manager as W. R. Ashburn. In 1945, Bob Ashburn started Ashburn Flying Service at Hybla Valley, helped by some Standard Oil financing. 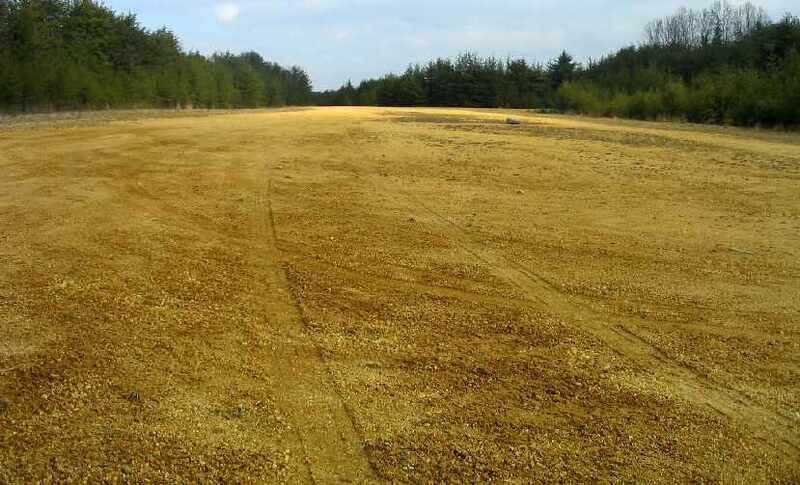 By now the field had 3 runways: 2 gravel & one paved, ranging from 2,500' to 3,000'. and mapping terrain for highways for the now burgeoning DC area. Eventually, the main runway reached 4,800', a pretty respectable runway for the era. Arthur Godfrey was known to come in his DC-3. Ashburn’s operation grew to 30 airplanes, with another 50 or 60 tied down around them. with facilities for meals & lodging as well as aircraft maintenance. 175 hp Fairchild PT-19s for advanced training & PT-26s for instrument training. Prices in that era were fascinating: A medical cost $5, dual instruction was $11/hour, and solo was $8/hr. The typical pilot training course cost $198 dual, $136 solo, plus $1 for a log book, totaling $335. the longest being three 5,000' strips oriented north/south, northeast/southwest, and northwest/southeast. The field was said to have 4 cinderblock hangars, the largest being three 150' x 30' structures. The airport was said to be privately owned & operated. 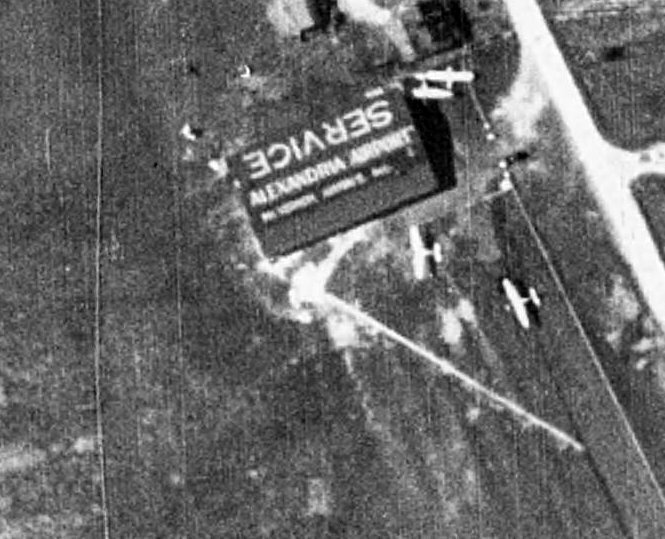 The 1946 USGS topo map depicted Alexandria Airport, as well as the nearby Beacon Field. and the Mount Vernon Drive In Theater below the landing gear. as having a 4,800' unpaved runway. 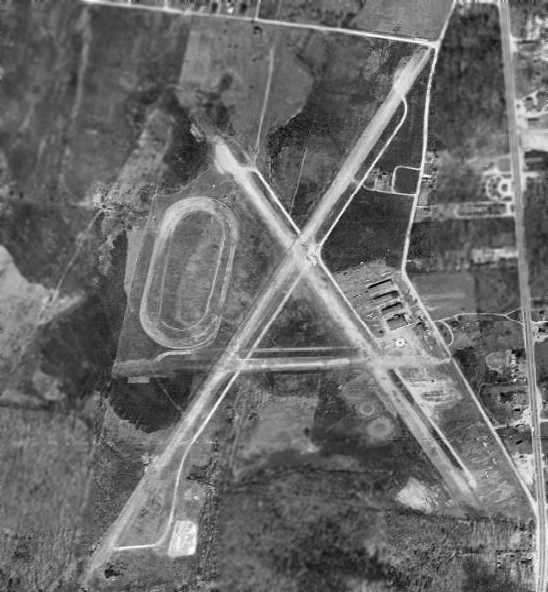 A 1949 aerial view depicted Alexandria Airport as having 3 runways. The 4th runway (depicted on the 1945 topo map) had evidently been replaced by a horse track. along with a total of 29 light aircraft visible parked outside. 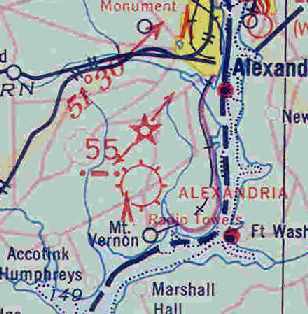 Beacon Field & Alexandria Airport, as depicted on the 1949 USAF Target Complex Chart. An undated (circa 1940s/50s?) 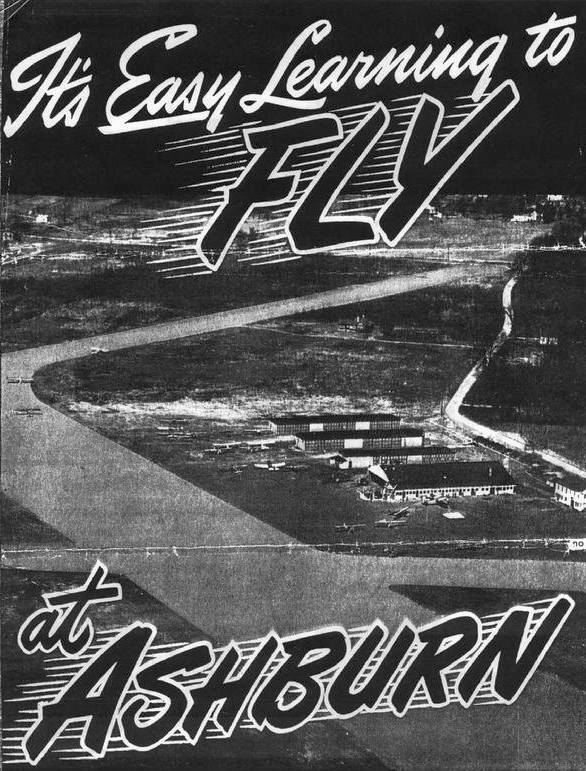 advertisement for Ashburn Flying Service featuring an undated aerial view looking north at Hybla Valley's row of 4 hangars. But all was not going well - the suburbs were surrounding the airport & the approaches were poor. sold it to a developer, but with a lease to continue to operate the airport until 1955. 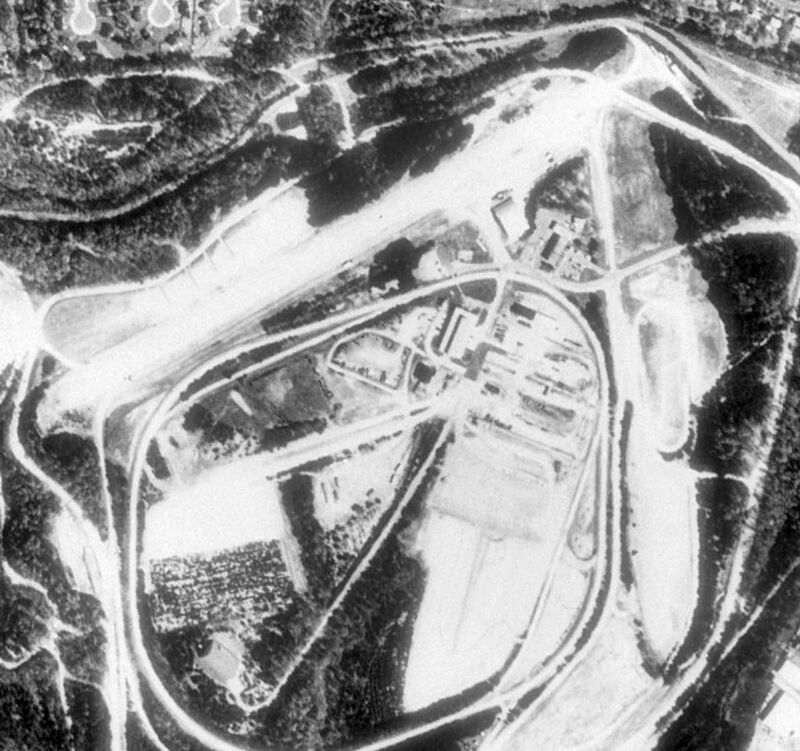 The 1951 USGS topo map depicted the 3 runways of Hybla Valley Airport, along with the oval racetrack on the airport's west side. The last aeronautical chart depiction which has been located of Alexandria Airport. was on the 1951 Washington Sectional Chart (courtesy of Mike Keefe). It depicted Alexandria as having 3 runways, with the longest being a 3,450' hard-surface strip (with a 4,800' strip available). 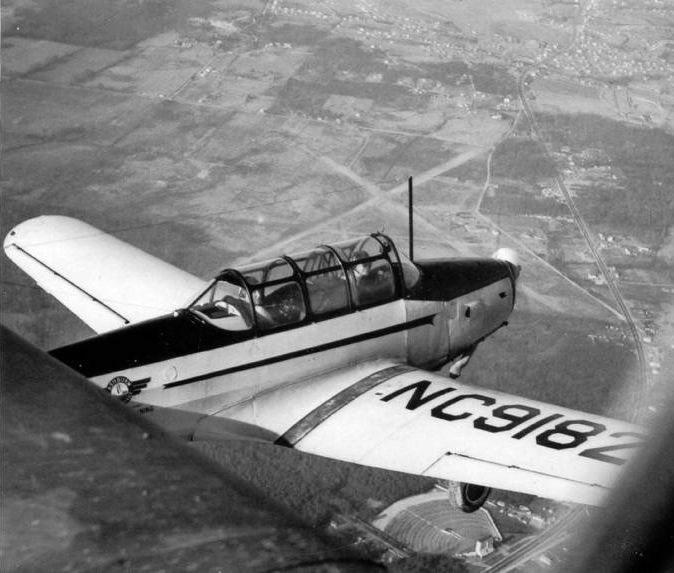 was a June 1953 photo (courtesy of Libby Haynes) of Libby Haynes & Ed Daggit in “Firebird”, her PT-23 at Hybla Valley. Libby recalled, “My 'Firebird' was a Fairchild PT-23, built by the St. Louis Boxcar Company (guess I'm lucky it didn't have flanged steel wheels). I bought it as World War II surplus in 1952 (for $500, over twice my monthly salary) and sold it in 1956 after my first child was born. My husband flew C-124s from Dover AFB, but he would ride with me! Originally, it was an open-cockpit airframe. Later, a model designated PT-26 was built with a sliding hatch. This airplane was identical to the PT-19 except for a slightly more powerful engine & the hatch. Merton Meade recalled, “We moved to Hybla Valley in the autumn of 1953 when I was a lad of 10 years. where absolutely NOTHING happened during the day during the week. introduced herself, and asked permission for her son to hang around. so he said if I'd behave myself I could stay around. A wonderful man was Bob Ashburn, and so was his wife Betty & the 2 daughters, Jane & Barbara. When I was at Hybla Valley, there were 2 runways in use. and the other was the 3,600' gravel one. Merton Meade recalled, “In the 1934 photo I recognize the big hangar which was there until after the end. The white house was not there in 1953. Paralleling the big hangar were 3 rows of T-hangars. I first met Arthur Godfrey at Hybla Valley & maintained a friendship with him until his death. At Hybla Valley, during those years, Bob Ashburn had 2 Cubs & one Luscombe. with the previous east/west runway apparently having been abandoned. 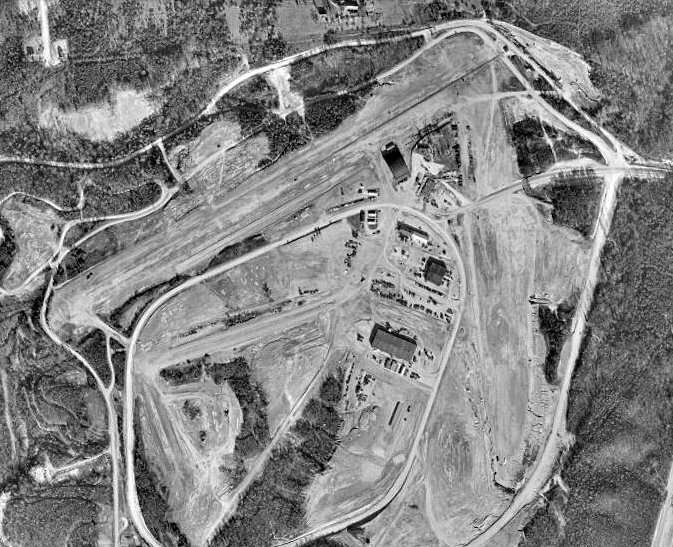 A closeup from the 1953 aerial view (from the Fairfax County Historical Imagery Viewer) depicted 5 light aircraft parked at Hybla Valley Airport. as having 3 runways, with the longest being a 3,450' hard-surface strip (with a 4,800' strip available). 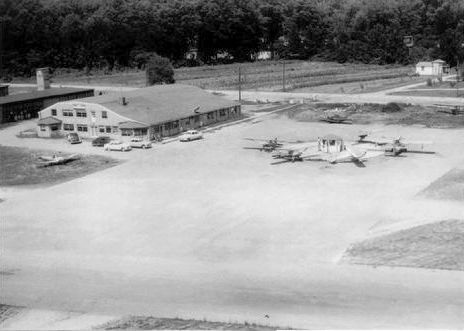 A circa 1950s aerial view looking northeast at a gaggle of light planes next to one of Hybla Valley's hangars. and after 32 years, Hybla Valley Airport was to be no more. 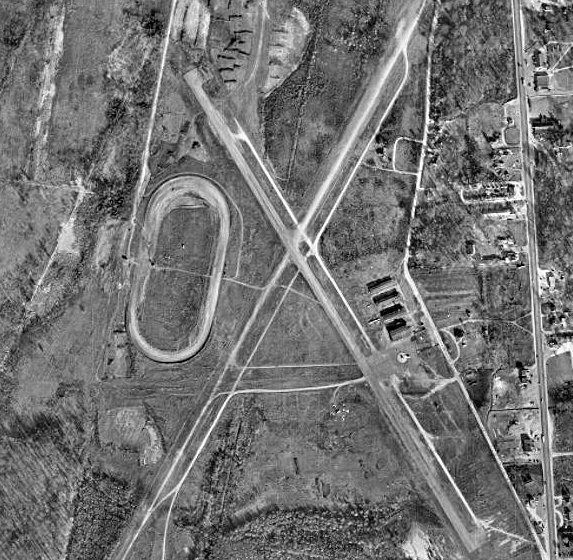 Ashburn Flying Service operated Hybla Valley Airport until the airport's closure in 1956.
and the former hangars were still depicted on the east side, but the airport itself was no longer labeled. 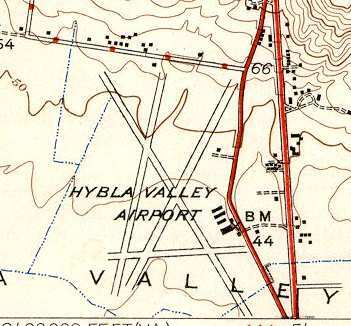 Hybla Valley Airport was no longer depicted at all. 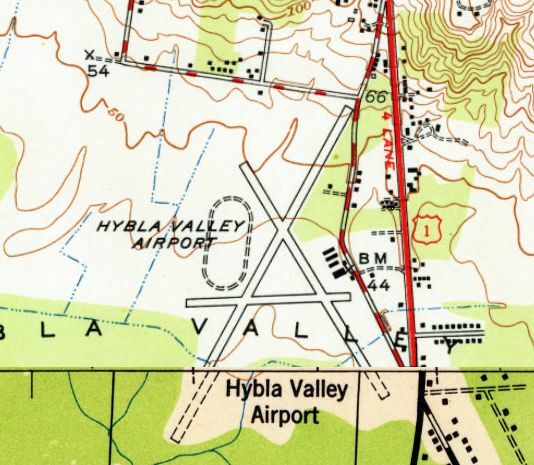 A 1957 aerial view showed that Hybla Valley Airport remained intact, but all the aircraft were gone. one hangar which remained standing for a few more years. Three other hangars had been torn down, and houses had been built over the northern portion of the field. The southern portion remained largely clear. 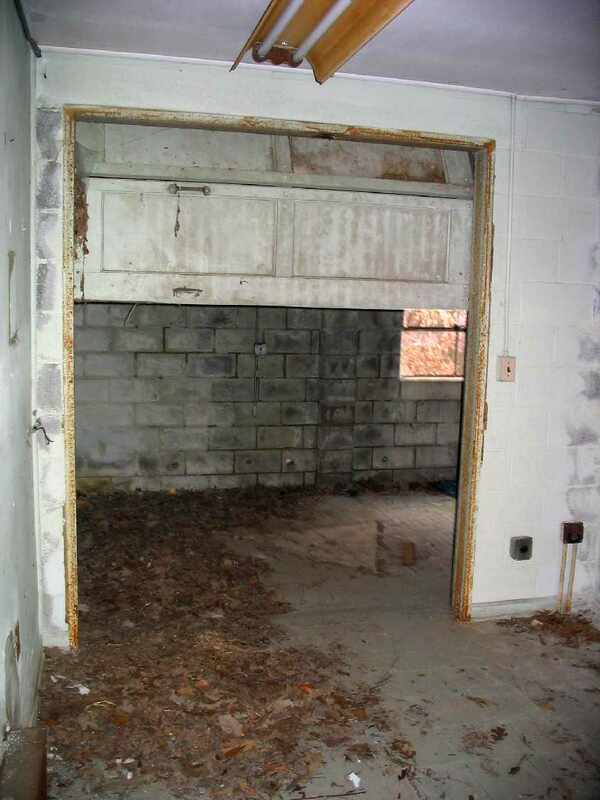 Cherrie of Hybla Valley recalled that "there were a couple of hangars on the west side of Fordson Road. They burned down around the late 1960s. The concrete pads the hangars sat on remained there for many years. A condo complex now sits where the airport used to be." Anthony Craig recalled that "I attended Hybla Valley Elementary School on Lockheed Boulevard around 1976-79. The teachers at the school would state that the school was built on an old airfield. Some even justified it by the flat land that surrounds us. I remember maybe 2 very tall, like a light post, but twice the size things in the yards around the school. I never knew exactly what they were, but the teachers stated that they were for aviation." 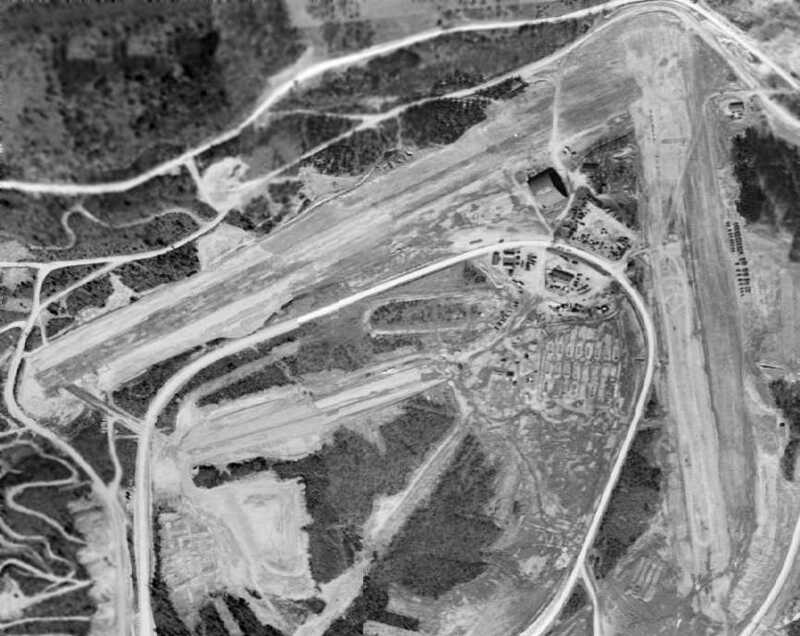 A 1979 aerial view showed that the last hangar was gone, with no trace remaining of the former airport. being occupied by the Hybla Valley School & a residential neighborhood. A 11/4/13 photo of a historical plaque erected in 2010 by the to commemorate the site of Hybla Valley Airport. Lockheed Boulevard, Piper Lane, Convair Drive, Grumman Place, Fairchild Drive, Stinson Road, and Northrop Road. The site of Hybla Valley Airport is located southwest of the intersection of Lockheed Boulevard & Richmond Highway (Route 1). 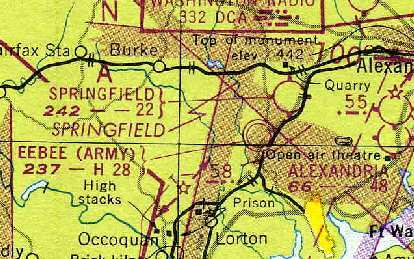 "EEBEE (Army)" airfield, as depicted on the 1948 Washington Sectional Chart (courtesy of Chris Kennedy). This former military airfield in the Washington suburbs is a real enigma. The author of this web site lives only 20 miles away from the site of this airfield, and yet never realized it was there. The exact date of construction of this airfield has not been determined. 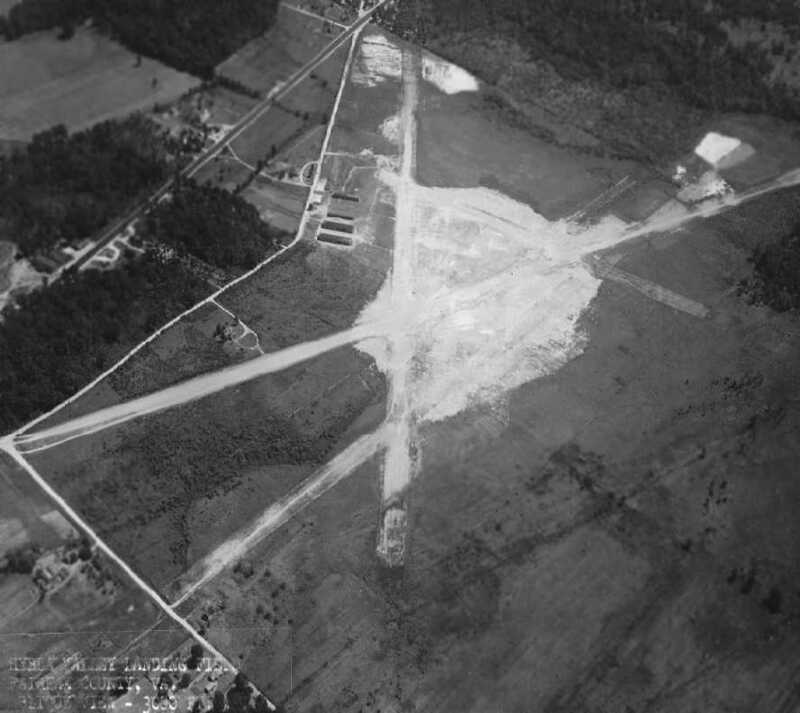 which depicted the EEBEE airfield & adjacent test track under construction. was located on the other side of Route One from present day Davidson Army Air Field. Apparently, targets were towed from south to north along a ridge line for gunnery training. and was no longer used much after the war [WW2]. 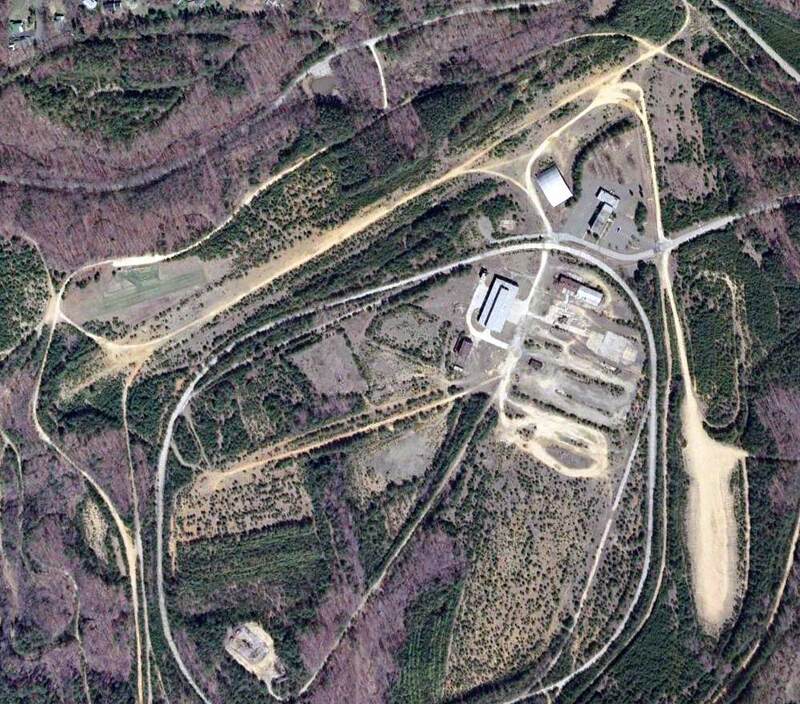 I believe that the Engineer Proving Grounds moved over to the EEBEE site after the war. both involving Stinson L-5 Sentinels (a light liason aircraft) at EEBEE Field in 1944, and another in 1945. No airfield at this location was depicted on the 1945 or 1946 USGS topo maps, nor on the 1947 Washington Sectional Chart. The earliest depiction of the airfield which has been located was on the 1948 Washington Sectional Chart (courtesy of Mike Keefe). It described "EEBEE (Army)" as having a 2,800' hard-surface runway. in the 8/16/07 issue of the Belvoir Eagle. because it also contained a facility & landing strip for aircraft testing. EEBEE was depicted as a closed airfield on the September 1948 USAAF Pilot's Handbook (courtesy of Chris Kennedy). 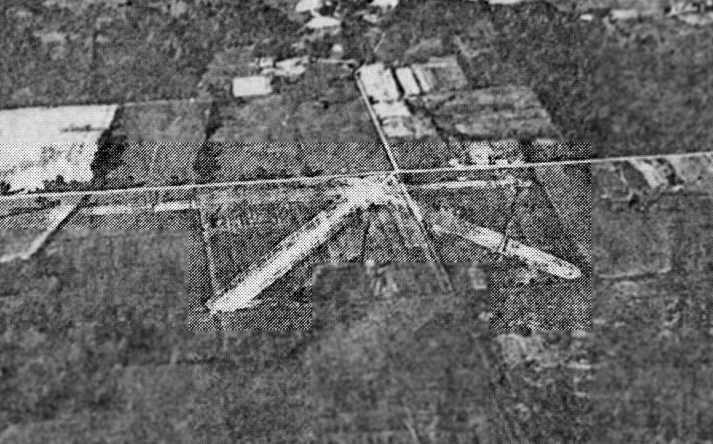 The earliest photo which has been located of the EEBEE airfield was a 1949 aerial view. It depicted the field as having 2 runways, with a single large arch-roof hangar just southwest of the runway intersection. 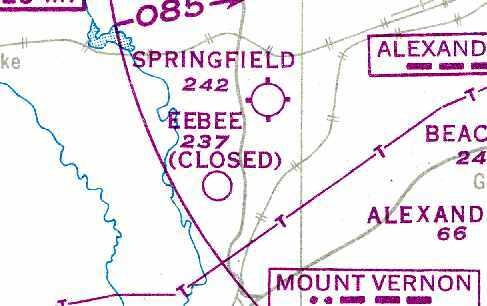 The 1949 USAF Air Target Complex Chart labeled the field as "EEBEE (USAF) (Closed)". as well as a single building (a hangar?) just southwest of the runway intersection. So this airfield was built & then closed after less than 4 years? This airfield's labeling on the 1949 chart as a "USAF" facility may have been in error. There is no other indication of there ever having been any Air Force facilities in this area of Northern Virginia. but this one may have been done in error. It was most likely always an Army facility. 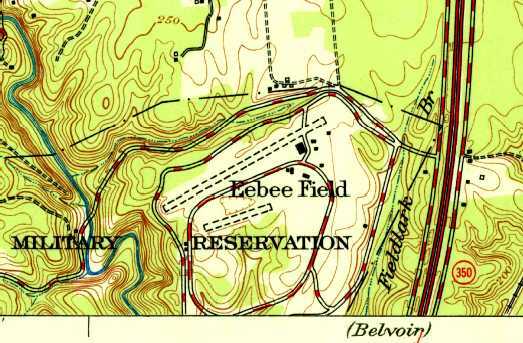 The 1951 USGS topo map depicted "Eebee Field" as having 2 unpaved runways, both oriented northeast/southwest, with several buildings. Strangely, the north/south runway on the east side was no longer depicted. It depicted "EEBEE (Army)" as having a single 2,750' hard-surface runway, with the remark, "Official business only." Art Follansbee recalled, "I worked at the Belvior R&D Labs in the 1960s to 1982. 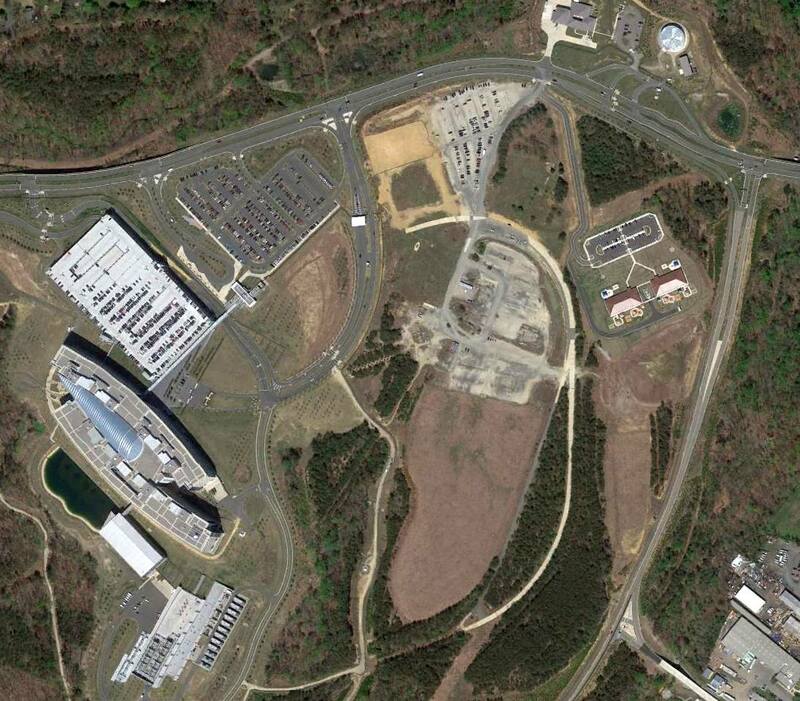 EPG [Fort Belvoir Engineering Proving Ground] was the test area for the Labs' activities. The hangar was open-ended & at that time used for test projects & storage. The old time workers told me that light Army aircraft used the strip until Davidson AAF was built in the mid-1950s. and sent to the FT Knox armor museum as EPG began to shut down." 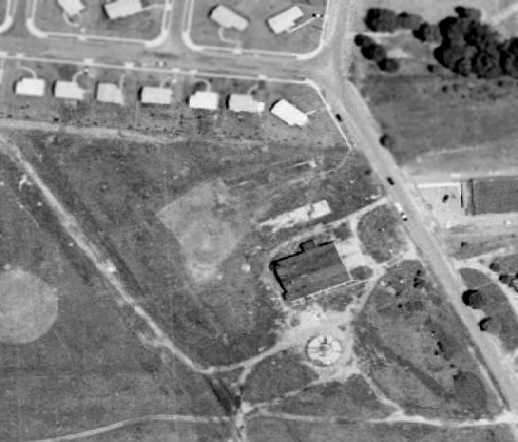 A 1953 aerial view (from the Fairfax County Historical Imagery Viewer) depicted EEBEE Field. as no airfield at all was depicted at the location on the 1955 Washington Local Aeronautical Chart (courtesy of Mike Keefe). The 1956 USGS topo map continued to depict 2 unpaved runways, labeled as “Test Area”. with 2 runways & a single hangar at the northeast corner. A 1979 aerial view showed that a 2nd large hangar was added on the southwest side of the field at some point between 1959-79. 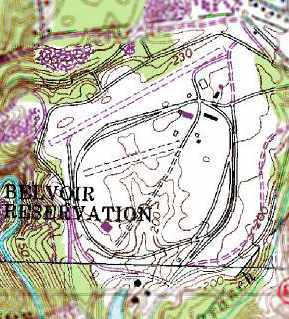 Two unpaved runways at EEBEE Field were still depicted (but unlabeled) on the 1984 USGS topo map. 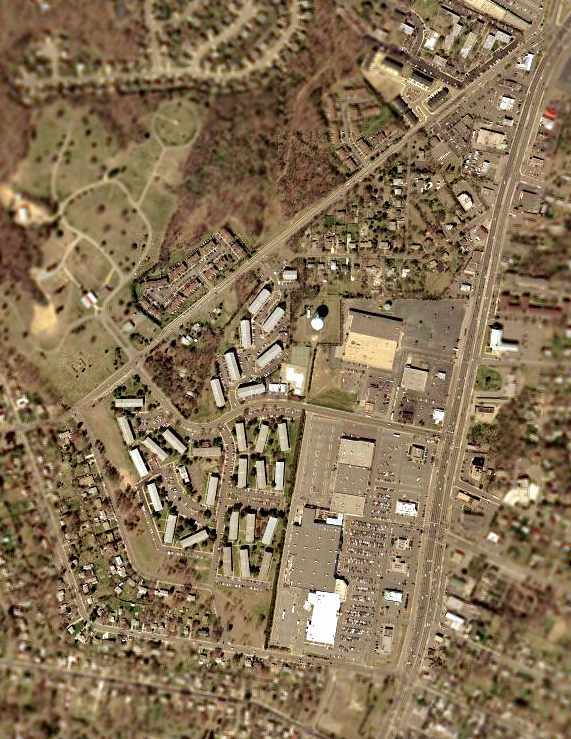 The overall property was labeled as the Fort Belvoir Military Reservation. and the former hangar still sat just southwest of the runway intersection. 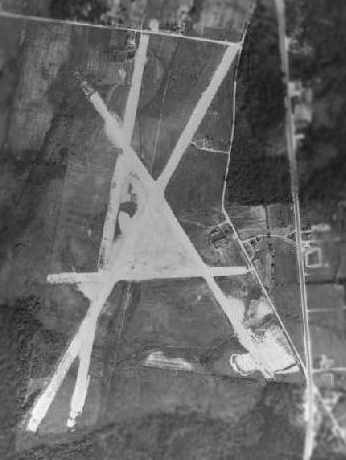 The location of this airfield was depicted on later street maps as the Army's Fort Belvoir Engineering Proving Ground. According to Mike Kentes, the Proving Ground closed in approximately 1991. Fort Belvoir itself is located a few miles to the southeast, on the other side of Interstate 95. 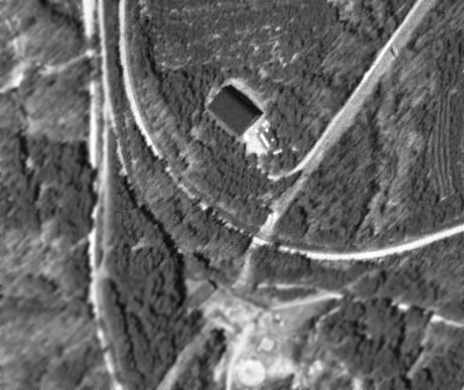 A 1994 USGS aerial photo of a building which sat at the southwest corner of the former EEBEE airfield. Mike Kentes recalled, “I visited it on 2 occasions. The building was a large hangar-type structure that was used for Electro-Magnetic Pulse testing. all over the floor about protecting against EMP pulses. The inside was a large wooden platform covered with sand, with a test stand in the middle, about the size of a phone booth. It was all-around weird. When I say large, I mean LARGE, it could have held a blimp. and what appears to be a hangar many times back when we were allowed to fly there." But the hangar-type building at the southwest corner was evidently removed at some point between 1994-2002, with only its foundation still visible. Note the radio-controlled aircraft "runway" just north of the west end of the east/west runway. 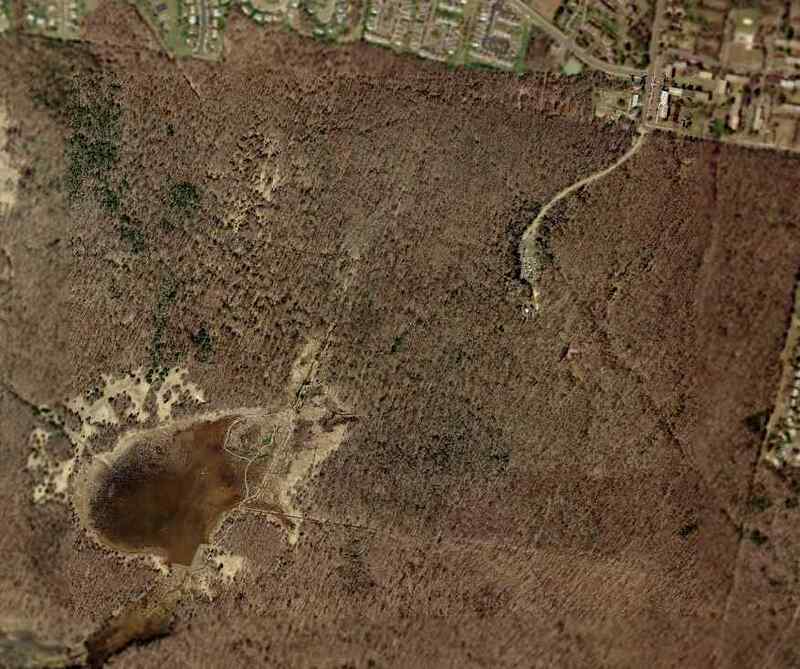 Jon Gravelin reported in 2003, "At the left hand end of the upper dirt strip (runway) is a small grass strip. This is, or was, back in 1999, a grass runway for Radio Controlled Aircraft, which is how I know about the area. An organization called the Pohick Pilots Association was allowed by the Army to operate that strip. The only condition was that we were to notify the nearby Control Tower (Ft. Belvoir, I think) when commencing operations. One afternoon, I lost control of the aircraft I was flying & began a futile search & rescue recovery operation. I owned a Jeep at the time, which was perfect for exploring the area in search of the plane. The building in the upper right, with the parking lot, is still used today. The other building seemed to be abandoned or for storage. The hangar-shaped building next to it, is in fact a hangar. and it also looked like a hangar or some sort of warehouse. The large diamond/oval road, is some sort of vehicle 'Test Track'. this leads me to believe it could have been a high speed track used when it was a proving ground. It was a very interesting site - makes you wonder what type of testing went on there." as one proposed location for a new baseball stadium for an expansion Major League Baseball team. this would seem to be a totally unsuitable location for a baseball stadium. on the circular track was for smart military vehicles. and control braking & acceleration to maintain following distance. I believe this was for the development of minimally manned resupply convoy concept. I'm sure this is only one of many projects that were conducted there. The site also contains numerous abandoned munitions bunkers to the southwest of the runways." A March 2005 photo by Paul Freeman looking along the north/south runway at the EEBEE airfield. A March 2005 photo by Paul Freeman looking along the eastern portion of the asphalt test track which runs inside the runways of the EEBEE airfield. 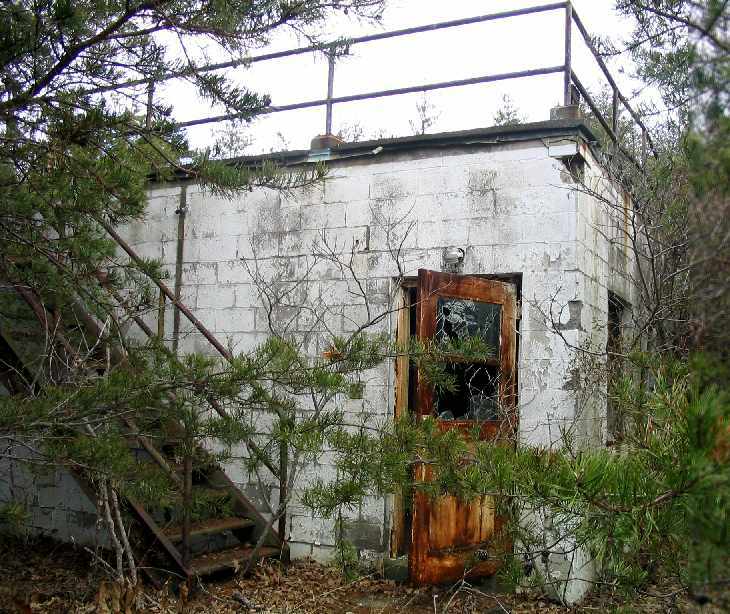 According to Mike Kentes, this building “was an old telescopic observatory. A March 2005 photo by Paul Freeman of the interior of the abandoned building on the east side of the EEBEE airfield. 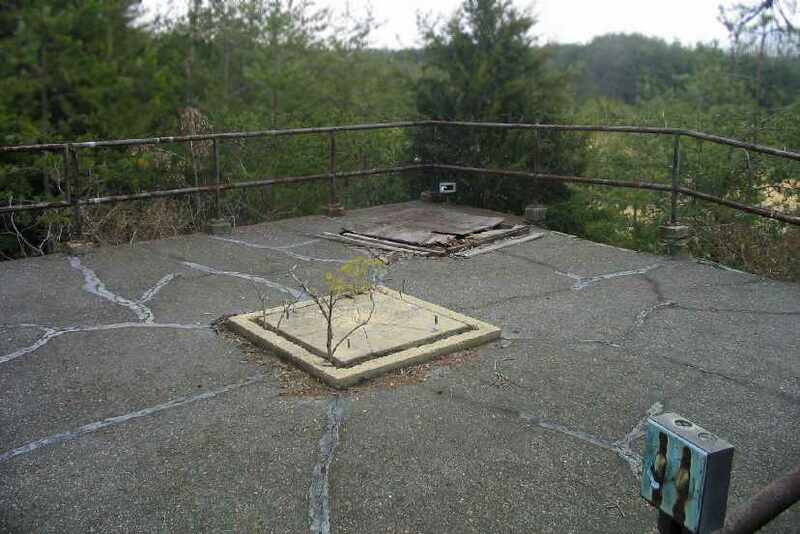 on the roof of the abandoned building on the east side of the EEBEE airfield. A circa 2005 aerial photo looking north at the 60-year-old former hangar on the northeast side of the EEBEE airfield. and that other parts of the property were planned for office buildings, housing, and a hospital. 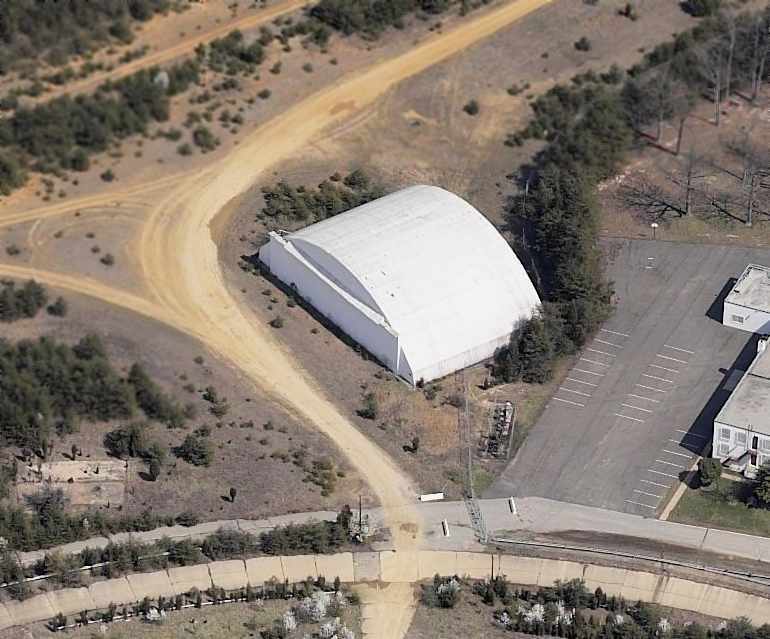 A 2007 aerial photo showed the hangar still remained standing on the north side of the EEBEE airfield site. with several new roads covering the site of the former runways. the only remaining trace of the airfield is the rough alignment of the southeastern runway end.